Here's another interesting ABT decal collection. This particular one is for Axis Allies. 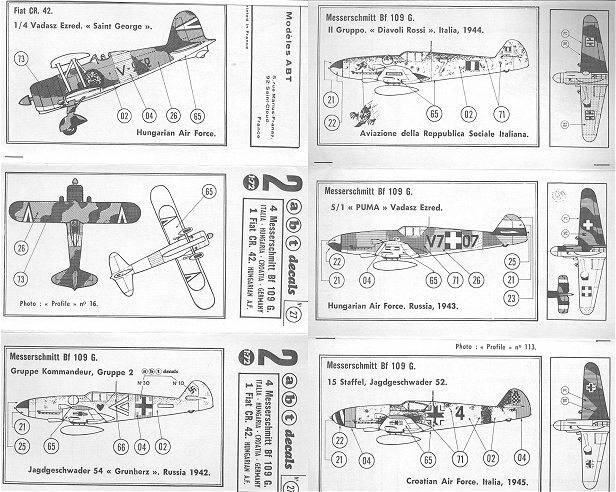 As you can see from the image above, most of these are Bf-109s. Not very surprising really when you consider that it was the most exported German aircraft of the war. There are two sheets in this set. One of them is just insignia in black and white while the other contains all the stuff in color. The only non-109 on the sheet is a Hungarian CR.42 in early war markings of the the red, white and green chevrons. 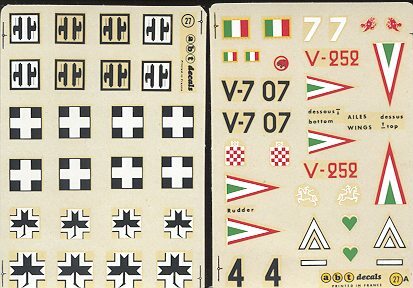 This is the marking currently used by Hungarian AF aircraft. Next is a normal Luftwaffe Bf-109G-6. this is sort of a bonus as there are no insignia offered in the sheet, just unique markings. From the Italian RSI comes the next aircraft. This and the other two foreign 109s have extra insignia in case you need them, a nice touch for the time. A later Hungarian 109G is next. Though still quite colorful, the insignia are now a simple white cross in a black square. The last one is a Croatian Bf-109. The Croats were not really an autonomous force, but allowed to use their own insignia in order to help build esprit de corps in the later years of the war. As with other ABT decals reviewed, these are rather brittle and do no conform well to the kit. I used the Croat markings on my Heinkel P.1078 and they were a real challenge to get to fit at all well. Setting solutions didn't help. Review copy courtesy of your editor's collection. If you would like your product reviewed fairly and quickly by a site that has many thousands of visits a day, please contact me or see other details in the Note to Contributors.